We present the first large scale investigation into the modular structure of a substantial collection of state-of-the-art biomedical ontologies, namely those maintained in the NCBO BioPortal repository. Using the notion of Atomic Decomposition, we partition BioPortal ontologies into logically coherent subsets (atoms), which are related to each other by a notion of dependency. We analyze various aspects of the resulting structures, and discuss their implications on applications of ontologies. 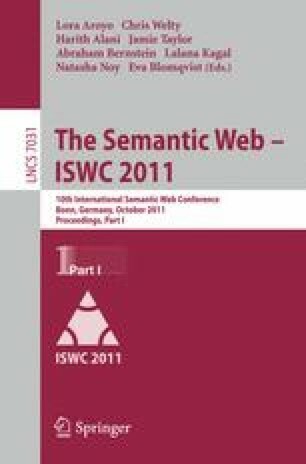 In particular, we describe and investigate the usage of these ontology decompositions to extract modules, for instance, to facilitate matchmaking of semantic Web services in SSWAP (Simple Semantic Web Architecture and Protocol). Descriptions of those services use terms from BioPortal so service discovery requires reasoning with respect to relevant fragments of ontologies (i.e., modules). We present a novel algorithm for extracting modules from decomposed BioPortal ontologies which is able to quickly identify atoms that need to be included in a module to ensure logically complete reasoning. Compared to existing module extraction algorithms, it has a number of benefits, including improved performance and the possibility to avoid loading the entire ontology into memory. The algorithm is also evaluated on BioPortal ontologies and the results are presented and discussed.